This week’s community news includes backpack and school supply drives, and an emergency loan program for wildfire victims. Assembly member Mike distributes backpacks to children during the 9th annual Back-to-School Community Block Party at LAFD Firehouse #64 in Watts, Calif., hosted by the $4.4 billion Kinecta Federal Credit Union based in Manhattan Beach, Calif. Kinecta and Nix Neighborhood Lending employees, members and vendors donated more than 500 backpacks filled with school supplies. 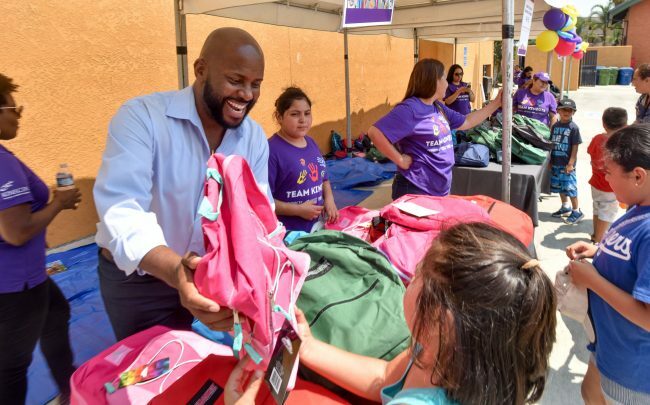 The essential back-to-school items and backpacks were given to hundreds of deserving elementary students in the Watts community. During the block party event, “Sweet Alice” Harris from Parents of Watts and Rep. Maxine Waters (D-Calif.) also helped distribute the backpacks to the children.